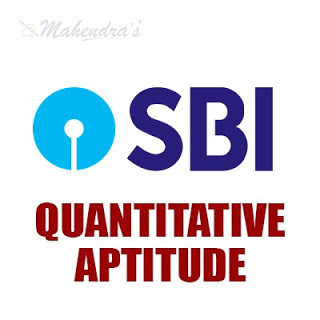 Mahendra Guru provides you a Bank Quiz of Quantitative Aptitude on daily basis to help you in your preparation for Govt job. You can clear your doubts before an exam. Mahendra Guru also provides you an important note and study material for all subject and test through its website, Mahendra Guru App and YouTube channel apart from it Speed Test Portal. Most of these preparation products are also available for purchase on my shop. You can also visit Mahendras.org to get more information about our endeavour for your success. You can also study in details through our E-Mahendras Facebook and Mahendra Guru YouTube channel. Q-(1-4) What value will come in place of question mark (?) in the questions given below? Q-2 (41)2 + (38)2 × (0.15)2 = ? 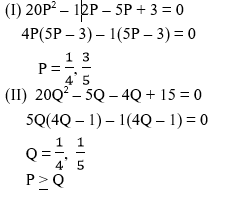 Q-(5-7) In each of the following questions two equations I and II are given. 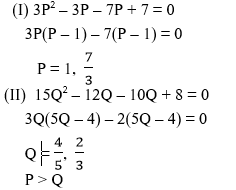 You have to solve both the equation and find out the values of P and Q and state the correct relationship. Q-(8-10) Read the following information carefully and answer the questions given below. The average age of Ramesh, Sushant, Vipul, Neelu, Amit and Rohan is 58 years. The total age of Amit and Vipul is 124 years. Sushant's age is thrice the Neelu's age. The average age of Ramesh and Rohan is 52 years. Vipul is 4 years younger to Sushant. The ratio between the ages of Ramesh and Rohan is 29:23 respectively. निम्नलिखित जानकारियों का ध्यानपूर्वक अध्ययनकर नीचे पूछे गये प्रश्नों के उत्तर दीजिए? Q-8 What is Vipul's age? विपुल की आयु क्या है? Q-9 What is the respective ratio between the ages of Amit and Neelu? अमित और नीलू की आयु के बीच अनुपात क्रमशः क्या है? Q-10 What is the average age of Sushant, Neelu, Vipul and Amit? सुशान्त, नीलू, विपुल और अमित की औसत आयु क्या है?